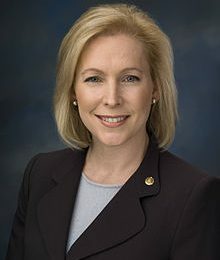 On March 17, 2019, Senator Kirsten Gillibrand (52) officially launched her candidacy for the Democratic nomination. Kirsten Gillibrand graduated from Dartmouth College and UCLA School of Law. She was elected to the U.S. House of Representatives in 2006 and elected as Senator in 2010. Democratic presidential candidate and current U.S. senator from New York Kirsten Gillibrand entered a lively Barley's on Thursday just after 7 p.m..
Kirsten Gillibrand of New York gave a sermon of sorts, summoning a fiery cadence that spurred shouts of "Amen!" from the crowd of several hundred.